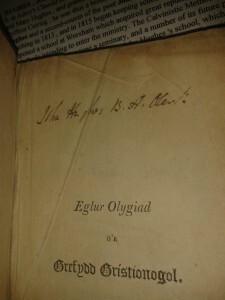 I have numerous Masonic books in my library, but one of my favourite books is a Welsh book published in 1801 entitled Eglur Olygiad, printed in Wrexham, North Wales by John Painter. This particular book is a Welsh translation of Thomas Gisborne’s Familiar Survey of the Christian Religion, a popular work at the time, and my book was recently restored to its former glory by the excellent Sharon Oldfield Conservation, with a sturdy spine, the pages set and the leather cover preserved. I came across it in a charity shop in Bangor about twenty years ago – it cost a pound. 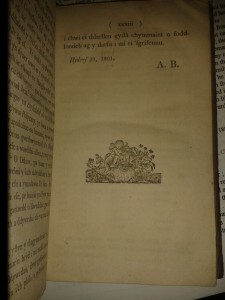 It is a rare book, though the subject matter is fairly common for the period, that of religious history. The history of the book itself is also important, and it has been signed by a previous owner of the book – a certain John Hughes BA Clerk. There are quite a few contenders for being the previous owner of the book; there were many John Hughes’ in Wales during the nineteenth century, and there were many of that name that were Calvinist Methodist Ministers, writers or authors of hymns. One particular John Hughes that is a good contender of being the owner, was the Calvinist Methodist minister and author born near Wrexham (where the book was printed) in 1796, brother of Wrexham printer Richard Hughes and second cousin of the celebrated Welsh poet John Ceiriog Hughes. Hughes began preaching in 1813 and opened a school at Wrexham in 1819, which was open until 1834. He became a renowned preacher and, after being ordained at Bala in 1829, and after the school had closed, he moved to Liverpool where he continued preaching. He was an author of books such as Methodistiaeth Cymru, a history of Welsh Methodism. He died in 1860. Another contender is John Hughes (1827-1893) from Anglesey. He attended Bala C.M. College and became a preacher, establishing a reputation in North Wales, especially in Amlwch on Anglesey and in Caernarvon. He was an author of such books as Hanes Yr Athrawiaeth Gristionogol in 1883. Considering I found the book in a shop in Bangor, which is very near to the Isle of Anglesey, and this particular John Hughes’ activity was in that area, he is also a leading contender for being the owner of the book. His interest in Christian history as a whole may have led him to have had such a book on his shelf. There were many other John Hughes’ from this period, such as Wesleyan Minister John Hughes (1842-1902), who worked in places such as Caernarvon, Rhyl, Liverpool and London. He also wrote hymns. Another contender includes John Hughes (1775-1854) who was a Calvinist Methodist Minister, an author and hymn writer, and another John Hughes (1776-1843) who was a Wesleyan Minister and antiquary. There are a few more, and all would have found inspiration in the book. Handwriting comparisons – difficult at the best of times – have not helped in determining which of the many ‘John Hughes’ could be the name on the book, but either way, I’m sure whoever it was, he was a professional who enjoyed the book and drew inspiration from it.